My high heels skittered across the classroom floor while I worked to finished the last of my bulletin boards. I took a deep breath, puffing myself up, and admired my work. School would start any minute and I was ready. The art supplies were arranged and labeled in cute, colorful containers. The reading area was cozy and inviting. My lesson plans were complete and my teaching certificate hung on the wall. Then my students arrived. Before the end of the first week, they left the markers uncapped and abused our class library. One child pulled and ripped the bulletin board border and another wrote a bad word on the cubbies. I clicked up and down the aisles, dragging those second graders through my lesson plans, but no one was learning. After a couple of weeks, the sight of my certificate made me cringe. I started shutting my classroom door. I tried harder, made more rules, and raised my voice. I worked longer on my lesson plans and created new centers. From under my closed door, my classroom light glowed into the night and I was exhausted. And things got worse. But with my door shut, no one saw me crying. This memory flooded back, recently, when I was reading from Nehemiah. Under Nehemiah’s leadership, the Isreaelites had just finished rebuilding the wall around Jerusalem. Ezra read, and their tears flowed. Surrounded by their bulwark of stone, their priest reminded them, law by law, that they were still vulnerable people. They seemed strong in the shadow of the wall, but were weaker than ever in the light of the law. I can imagine the irony of that scene: their new, wall-building muscles bulging as they hunched under the weight of their weakness. And so it was with that first-year teacher. Her bulletin boards, high heels, and certificate looked good from the hallway, but she was crying over her desk- under the weight of her failure. With this one-sentence reminder, he pried their focus away from themselves, releasing enough power to dry their tears and straighten their backs. The Lord would not leave them in their weakness. I didn’t hear her come in. She found me crying and sat beside me. Everything in me wanted to convince her that I simply wasn’t feeling well, or that I had allergies, or that my dog had died. But I was at the end of my rope and too tired for convincing. And I knew that she knew. I don’t remember the words that my mentor teacher said that day. I just remember how I felt. Relieved that I didn’t have to pretend. Encouraged that she could help. Hopeful that things would change. Joyful that I wasn’t alone. I dried my tears, and showed up the next day, feeling better. Stronger. The joy of the Lord always seems to be found at the end of ourselves. He teaches me over and over, but I still live like I don’t know. 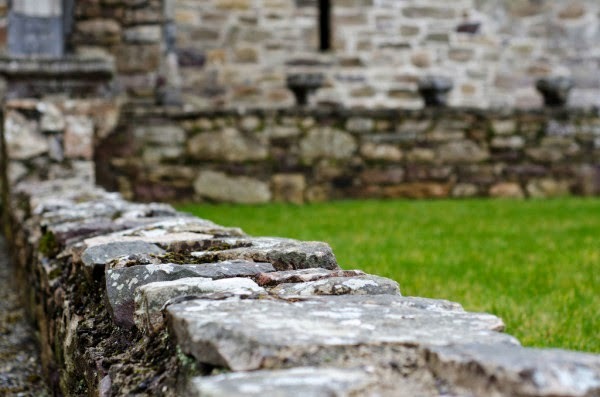 Time after time, I place my confidence in the stone walls I’ve built around my kids, my marriage, and my image, but the enemy still finds his way in. I tighten my grip on my own skills, but failure always seems to leave me wide open and vulnerable. I flex my muscles in the shadow of my work, yet the slightest winds of life knocks me down. But the Israelites and I practice the same lesson: these tears of weakness should not grieve us, for they are the way to the gospel…where His joy and strength are found. After hours of reading the words that displayed the weakness of the people, the high priest, Ezra, stepped down from a wooden platform. The reading of the law was complete and its purpose was fulfilled. And after hours of paying the price that displayed the love of the Father, Jesus, my high priest, was brought down from a wooden cross. The fulfillment of the law was finished and the work was complete. Whether we are at the wall, on the hill, or in the classroom, our tears of weakness wash us down the road to the Source of joy and strength. So I can cry without grieving. I can open my door to Him. And I’m on my way to knowing.